now surrounded by traffic, is on a hill with cypress trees, that may be an Etruscan tomb, famously presented in Arnold Boecklin’s ‘Island of the Dead. Its tombs are sculpted by some of the greatest sculptors of the nineteenth century. It is the burial place of the poets and writers, sculptors and artists, Elizabeth Barrett Browning, Walter Savage Landor, Arthur Hugh Clough, Frances Trollope, Hiram Powers, Joel Hart, many friends of Florence Nightingale, and many participants in the Battle of Waterloo. Burials now can be of cinerary urns and bones, no longer entire bodies. 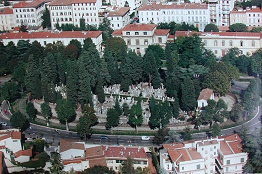 Oglejte si English Cemetery, Florence, Italy na večjem zemljevidu.